Two weeks ago we got excited about the forward-backward asymmetry of the top quark pair production. The CDF experiment says that the asymmetry at large t-tbar invariant mass is nearly 50%, as far as 3.4 sigma away from the standard model. A last week paper of Gilad Perez & co. points out that there exists another CDF measurement related to top quarks which also shows a large discrepancy from the standard model. The funny thing is that the latter result has been available as a public note since last summer but it went relatively unnoticed. The numbers and plots quoted below are take from this recent CDF talk. Although it is not immediately clear to the eye, there is an excess in the signal box. One counts 32 events in the top mass window, while QCD predicts only a third of that. It looks like CDF has captured 10-20 boosted tops. But the standard model predicts much less than that: only about 3 top events should be in the window! The excess is 3.4 sigma. One could easily imagine new physics producing an excess of boosted tops; the canonical example would be a heavy gluon in the Randall-Sundrum scenario. Then why is CDF not jumping around claiming an evidence for new physics? The reason is that there is a certain tension with that interpretation of the signal. The fully hadronic decays, targeted by the above plot, constitute only a subset of the top events. Almost as often, one of the top quarks should decay leptonically, that is t → b + lepton + neutrino. For boosted tops, the charged lepton (e,μ,τ) merges with the b-jet and cannot be easily discerned, but the missing energy carried by the escaping neutrino should be registered. Thus, in the case of semileptonic decays of a boosted top pair one should observe one high-pT jet in the top mass window accompanied by large missing energy (those events were excluded from the previous plot). The relevant plot is pasted on the right. There is no excess, but actually a small deficit in the signal box where QCD predicts some 31 events and CDF observes 26. Because of the unclear interpretation, CDF decided to play it safe /swipe it under the carpet, chose one. In their note they dumped together the fully hadronic and semileptonic samples, in which case the excess becomes insignificant, and quoted only this unexciting in the abstract. There are several possibilities on the table now. By far the most probable is that the hadronic excess is a fluke or is due to an underestimation of QCD background. Conversely, the deficit in the semileptonic channel could be a downward fluke, and there is indeed an excess of boosted tops at the Tevatron. The third possibility is to take all the hints from experiment seriously. 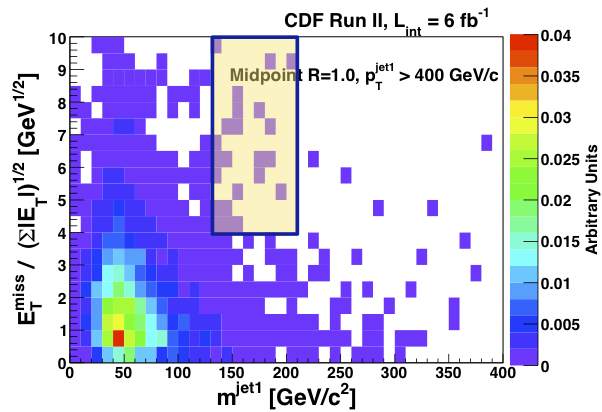 An excess in the fully hadronic channel and the lack of an excess in the semileptonic channel may suggest that Tevatron is seeing a new particle that decays exclusively to hadrons and whose mass is accidentally close to the top quark mass. For example, the paper of Gilad & co. argues that a light gluino decaying into 3 quarks (that is assuming supersymmetry with R-parity violation) can be made consistent with the data. Whatever it is, this is a kind of signal that the LHC should eat for breakfast, if only it is real. CDF also has a search for generic 3-jet resonances produced with large pT, which has a 2-sigma-ish excess over the SM expectation in the neighborhood of the top mass. Im curious about the QCD backgrounds in these events. 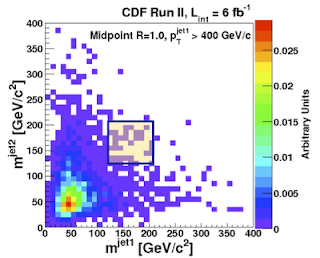 Will CDF borrow some of the LHC data and revise some of their searches after the detector goes off line? The background obviously differs for these different experiments and hard to translate exactly, but in principle can it be done and will it be done? No. QCD background is indeed the trickiest part, but the LHC cannot help here.